A Bergen County, NJ, woman’s search for an artist’s identity. Coral Petretti’s collecting obsession began more than 30 years ago. It was in the mid-1980s. She backed her car out of her garage and knocked over a frame that had been stored there. The object within the frame, a vintage mirrored beer sign, was shattered. As she examined the wreckage, she discovered the mirror had hidden another image. It wasn’t a calendar picture. Nor a photo reproduction. 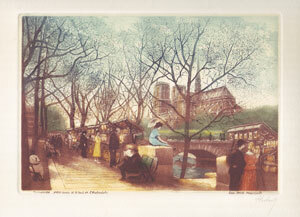 It was a signed, hand-colored print of a Paris scene. What was this? She had paid just a dollar for the beer sign at a flea market. She thought it “tacky” but liked the frame. In the end, she didn’t find a use for it so it sat in the garage gathering dust — and concealing its secret. Its secret featured a promenade along the Seine with Notre Dame Cathedral in the background. It wasn’t a contemporary picture. The peoples’ clothes were old fashioned. So was the method of execution. Meticulous. Faithful to the reality, but a bit dreamy. To Petretti, it seemed as if something found in this unusual manner just had to be valuable. Hadn’t she read about such things in the newspaper? Stories of people who had come across something while cleaning out an attic? Or taken a closer look at Grandma’s dusty painting? Or, like her, had looked behind one work and found another? Stories of art discoveries almost always hinge on attribution. The work turns out to be a lost, forgotten or unknown work by a great artist. Someone like Caravaggio or Van Gogh. In 2015, a painting found beneath a ping-pong table in a Bloomfield, NJ, basement was revealed to be a work by the teenage Rembrandt. It fetched more than a million dollars at auction. Petretti’s eyes went to the signature scrawled at the bottom of the picture. She couldn’t quite make out the name. As she wrote some years later in a blog devoted to the mystery, “…was it Huberly? Huberty? Hubey? Or Hubert with a flourish?” She settled on the most likely reading, “Hubert.” Above the signature were the French words Eau-Forte Originale, which identified it as an etching. 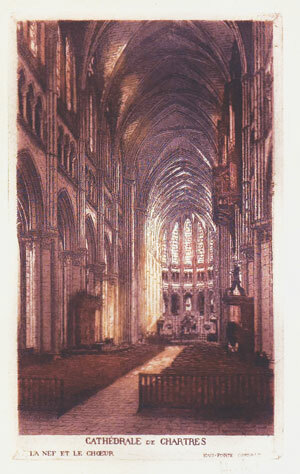 Etchings produce black-and-white linear prints. This one had then been hand-colored with watercolor. Beyond that and the title—which identified Notre Dame as the subject—there was no other information. Nothing on the back. No date, although the people’s clothing seemed to place it in the late 19th or early 20th century. With hopes of a windfall, Petretti began to make inquiries. But her search went nowhere. Sotheby’s auction house never returned her call. The local library was no help. Neither was the Museum of Modern Art. Whoever he was, it seemed Hubert was not a household name in the art world. Petretti didn’t have time to pursue it further. In those days, remember, the Internet was a slow and clumsy tool. We used dial-up modems and logged onto primitive providers such as CompuServe that charged by the minute. There was no Google. Television’s “Antiques Roadshow” was a decade away. So Petretti had her print framed and hung it on the wall. Her dreams of quick riches gave way to emotions that were deeper and more private. She hadn’t been an art lover before. But she was engaged now. 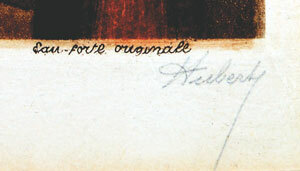 Hubert was her artist, her discovery. He offered her a portal into a simpler, prettier world in which she could imagine herself as, she later wrote, “the carefree lady in the yellow dress strolling the Seine…” untroubled by the realities of office politics or—as the mother of four—rising tuition rates. This is where things stood for about 20 years. Then, in 2005, she mentioned her old Hubert discovery to a coworker. She was working in the photo department of ABC Studios. Her friend was in the IT department and agile on the Internet. Within a week, he had found another Hubert etching on eBay in Canada. 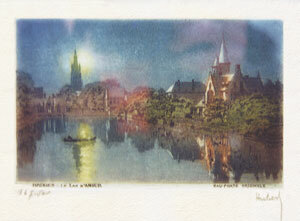 Soon she had acquired a mate for her original find—this one a night scene of Bruges in Belgium. For the next two years, she and her coworker ferreted out other Huberts. All were hand-colored etchings of popular attractions in France or Belgium. One was a work of imagination, portraying Genevieve, the patron saint of Paris. The prints ranged from postcard size to 11 by 14 inches. Her collection grew without yielding any information about the artist. 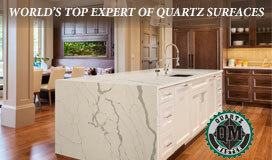 The Internet also helped Petretti get in touch with experts. She talked to museum curators and appraisers. No one knew who the artist was, but the consensus seemed to be that he was a “souvenir artist,” one whose works were once sold to tourists looking for a memento. Petretti was undeterred by this dismissive attribution. She remained faithful to her Hubert. She educated herself on the craft of etching. On a trip to Paris with her husband she combed the booths of the Paris flea market for works by him. She drew on her high school French to craft a letter to a museum curator there. Along the way, she did what many bloggers do—she chronicled her everyday life and concerns: preparing a Thanksgiving Day dinner, deciding the fate of a beloved old car, weddings and visits with grown children. The blog petered out eventually. Her last entry was in 2017, the only one for that year. In it, she featured a print she’d acquired by the American artist Hubert Morley, whose style was comparable to that of her Hubert. It seems he had spent some time in France during World War I. It was a longshot to be sure. There had been other Hubert candidates. Each had been considered, then ultimately ruled out by research. To date, she has acquired some 200 prints by her artist. She has them in all sizes and in duplicate and triplicate versions that she can study and compare. Most are in archival folders. Some hang on a wall in an upstairs hallway of her house. “My husband says I’m the world’s leading collector of Hubert etchings.” She laughs. Will she ever crack the mystery? Does it matter? The thrill, as many have discovered, is in the chase. And art, as many also learn, is its own reward. Columnist John Zeaman is a freelance art critic who writes regularly for The Record and Star Ledger newspapers. His reviews of exhibits in New Jersey have garnered awards from the New Jersey Press Association, the Society of Professional Journalists (New Jersey chapter) and the Manhattan-based Society of Silurians, the nation’s oldest press club.